MONTRÉAL (BRAIN) — The North American Bikeshare Association is producing a three-day conference later this month. The organization's fourth annual conference will gather bike share companies and community officials from around the world to discuss best practices and the future of bikeshare, the group said. BOULDER, Colo. (BRAIN) — Sally Jewell, the former Secretary of the Interior and former CEO of REI, will deliver the opening speech at the Outdoor Industry Association Industry Breakfast at Outdoor Retailer show this month. DENVER, Colo. (BRAIN) — Outdoor Retailer on Thursday announced it is moving its show to Denver starting next year, when the show will hold three events in the city. DENVER (BRAIN) — The Denver Post, citing anonymous sources, is reporting that the Summer and Winter Outdoor Retailer trade shows will be held in the Mile High City for the next five years, starting with the winter show next February. ASHEVILLE, N.C. (BRAIN) — The Eastern Outdoor Reps Association said participation was up 8 percent at its recent trade shows in New Jersey, South Carolina and New Hampshire. Retailers from 21 states attended the shows, EORA said. SAN JUAN CAPISTRANO, Calif. (BRAIN) — Interbike has a number of new initiatives on tap for this year’s show, including a new crowd-funding area called The Incubator, and a New Product Showcase area. SAN JUAN CAPISTRANO, Calif. (BRAIN) — Emerald Expositions, the parent of Interbike and Outdoor Retailer, has acquired the SIA Snow Show for approximately $16 million. Emerald plans to merge the SIA Snow Show with Outdoor Retailer to become the Outdoor Retailer + Snow Show, with the first combined show held in January 2018 in Denver, Colorado. PHILADELPHIA (BRAIN) — For the first time, this year's Philly Bike Expo will include pre-show industry-only access, along with free admission for bike shop owners and related vendors, suppliers and sales reps. Qualified registrants gain early entry to the expo on Nov. 4 and 5 and receive invitations to exclusive nighttime social events. PORTO, Portugal (BRAIN) — The inaugural World Cycling Forum, set for June 7 and 8 in Porto, Portugal, will focus on “consumer centricity and increasing speed to market,” organizers stated. MONTEREY, Calif. (BRAIN) —Don't pin the "adventure bike" tag on Kona’s new generation of road-plus-tired, disc brake Rove bikes. “It’s more our take on an endurance road bike than it is on something like an adventure bike,” product manager Ian Schmitt says. The Netherlands and Switzerland (BRAIN) — The World Federation for the Sporting Goods Industry and Bike Europe are planning a conference for June 7-8 in Porto, Portugal, that will focus on consumer centricity and increasing speed to market for the bike and e-bike industries. After call with Utah governor, Emerald Expositions to walk away from Salt Lake. 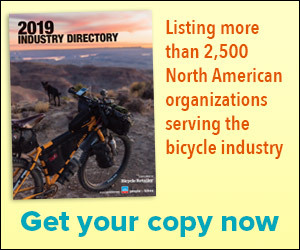 SAN JUAN CAPISTRANO, Calif. (BRAIN) — Interbike said Thursday that Utah is no longer in consideration as a potential show venue in 2018 or beyond. CHICAGO (BRAIN) — The Chicago Area Bicycle Dealers' Association has sold out of exhibitor space for its upcoming trade show, which is Feb. 1-2. CABDA organizers expect nearly 175 exhibitors at Pheasant Run Resort and Convention Center.